Every artist needs a place to get away to work in peace. 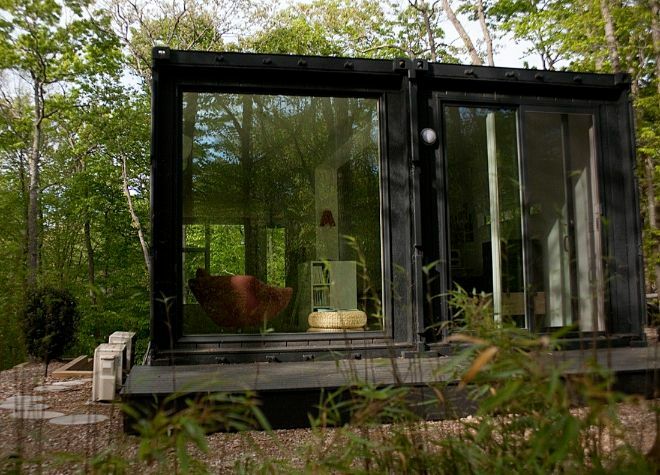 Quiet, welcoming, and open, two shipping containers were cut apart and constructed to create a 900 square foot art studio in the woods. With a secret downstairs area, the container's high ceilings and rooms give the impression it's much bigger than it truly is. With an added sitting and relaxation area, and plenty of natural light via wall-sized windows, this studio is the perfect retreat for a day of painting. Once the sun goes down, it becomes a quiet reprieve from a hectic day and a great place to unwind. The upstairs area offers plenty of room for chairs, a sofa, a table, and other spots to sit and unwind after a day at work. The living area faces giant windows that provide you with a spectacular view of the outdoors. A small corner work area is available should inspiration strike at any minute. During the day, the sun-filled area is relaxing and lovely; at night, it becomes magical. Head downstairs to see the full sized art studio, which the designers accomplished by cutting the bottoms from the two shipping containers in order to built multiple levels. The result is a cozy studio with plenty of space for tables, stools, canvases, and materials. Tall ceilings and high windows give the space a wide open feel and provide daytime light for work, and lots of wall space begs to be decorated with the artist's latest pieces. A side door leads to a smaller space with shelves for art books and other supplies, as well as a table for a quick coffee break. The space is functional, spacious, and minimal. Track lighting provides subtle but powerful light, and ceiling fans keep the area cool during warm days. 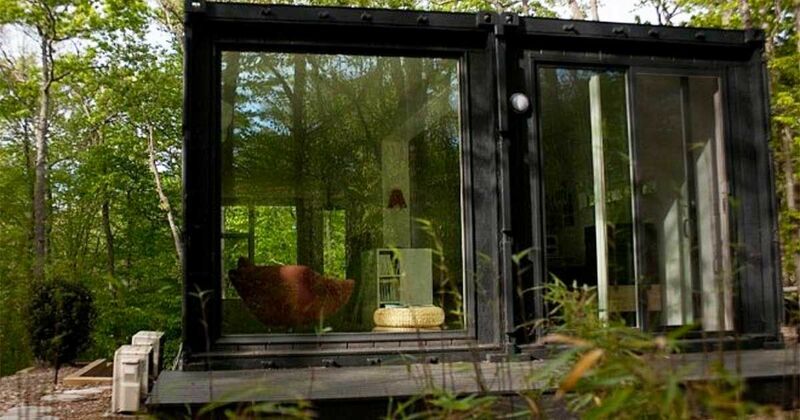 Tucked into the forest among the trees, the studio feels secluded and private, and the exterior gives no clues to the expanse of space inside. At night, the studio is a charming spot to spend time. 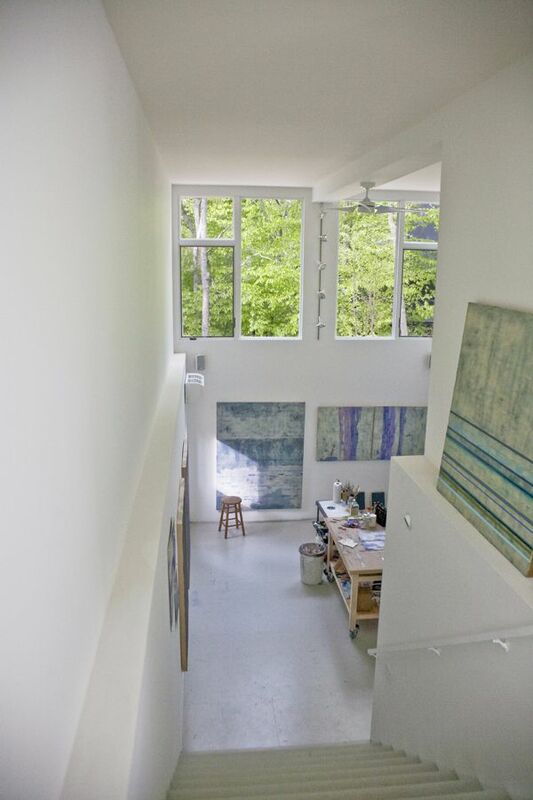 The owner of the studio has a home nearby, but often retreats to this stunning studio for work. 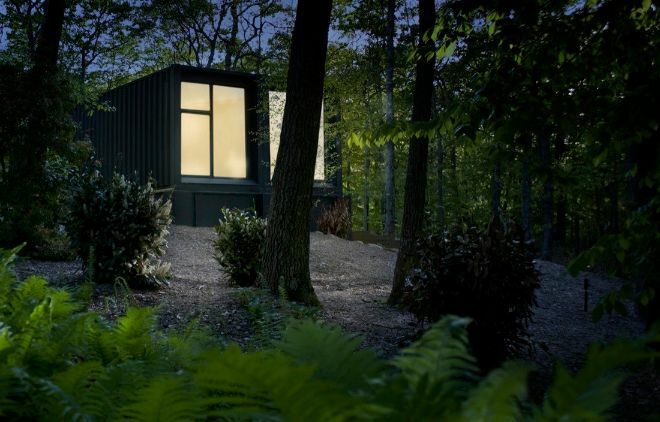 It's easy to see why an artist would enjoy this secluded getaway.